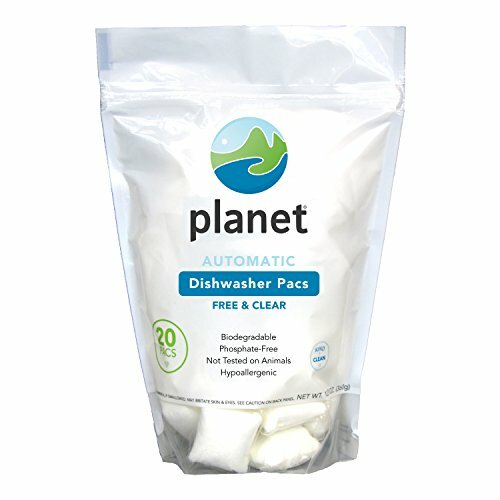 Planet Automatic Dishwasher Paces contain a highly effective biodegradable formula that is completely phosphate and chlorine free. It will leave your dishes clean and virtually spotless. Our Free & Clear formula does not contain any added fragrances or dyes, and is certified 100% biodegradable by SCS Global Services. Ingredients are from plant-based sources. Formula is phosphate free and safe for septic systems. Comes in a re-sealable pouch. One pouch contains 20 single-use detergent paces and one case contains 12 pouches (total = 240 paces).